Subtraction in kindergarten can definitely be a tricky concept to learn. I came up with a pretzel subtraction problem solving activity for my kindergarten students to do. 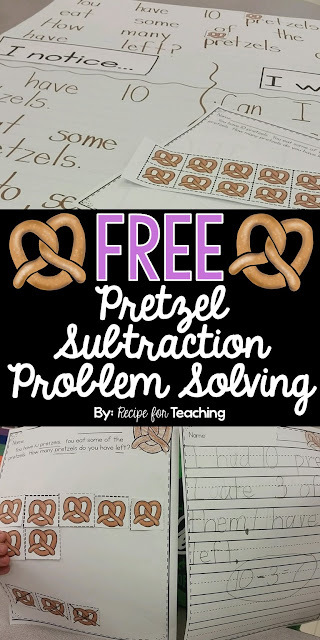 I thought this would be a fun and engaging subtraction activity for them and plus pretzels make a yummy snack!! *I did this lesson over two days. The first day was a "Notice and Wonder" and the students actually solving the problem. The second day was having my students write about their math. The way that I started this subtraction problem solving was with a "Notice and Wonder." If you haven't heard of this strategy, you present the problem to your students and then, using a t-chart, have them share what they notice about the problem and what they wonder about the problem. The "Notice and Wonder" strategy is a great way to get your students to tell the information they notice directly from the problem and then get them to wonder about the problem by asking questions. You can also use this strategy for different subject areas. After we completed the "Notice and Wonder," I gave my students a pretzel ten frame. The ten frame has ten clipart pretzels on it. Then, I gave my students ten pretzels and had them cover up each pretzel picture with a real pretzel. 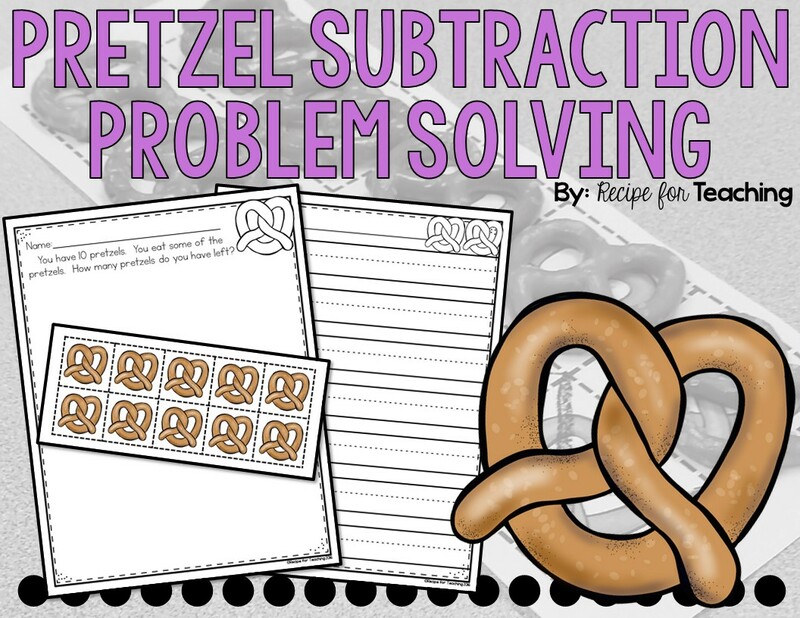 Next, my students cut out the pretzels from the ten frame and glued them on the problem recording sheet. I think it really helped for my students to "X" off the pretzels on the ten frame before cutting out the pretzels. The next day I had my students write about the problem and what happened with their pretzels. I like to have my students write about their math whenever possible because it really helps to get their ideas down and communicate what happened. A lot of the time I find that they are able to verbally tell me what happened, but writing it down can be a little more challenging. This is why I like to give them practice writing their ideas whenever possible. The did an awesome job with this and I love when my students see that there are many ways to solve one problem! If this is something you can use with your students, just click the image below to get your FREE download!